One week ago today I was happily at the store having a girls day of cropping and fun. 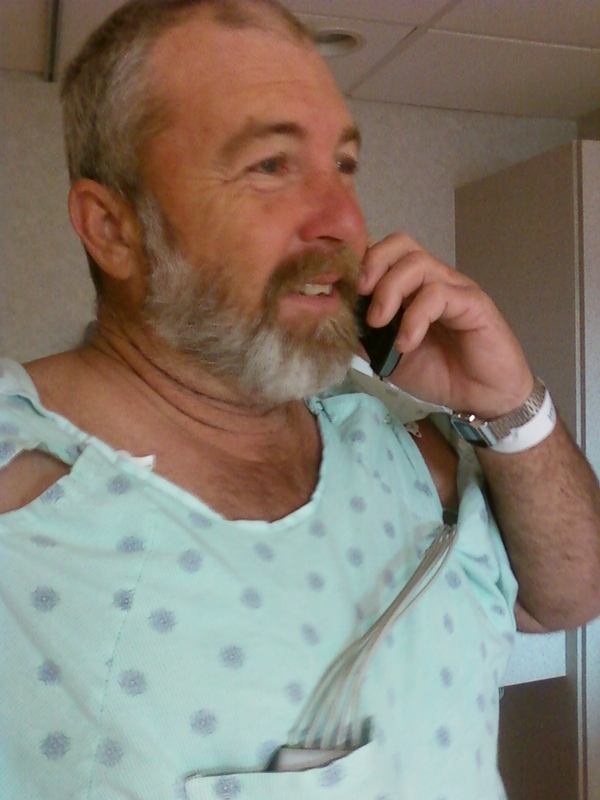 I answered the phone and it was a deputy saying to stay calm that he was with my husband and he had paramedics coming. My heart immediately did a flip flop and in the course of a less then a minutes conversation...my whole world changed and I just needed to get to Kenny and see for myself that he was indeed going to be alright. I left to store headed to the hospital. This was the longest 30 minute drive, but somehow I made it to the hospital before the ambulance. I waited what seemed a lifetime, shed some tears and images of our life together ran through my mind. I finally got word that the ambulance had arrived and they were working on him trying to stabilize him. I couldn't wait anymore...I followed someone else through the ER doors and made my way to my husband. At this point the nurse was chewing him out for not taking her orders seriously...you see he is a little hard headed. He was indeed in A-Fib with an erratic rhythm and they were on their second dose of meds to bring it to a regular rhythm. It took three doses, finally his heart had slowed and it was where they needed it be. He was admitted and we were told that they needed to do all kinds of tests. 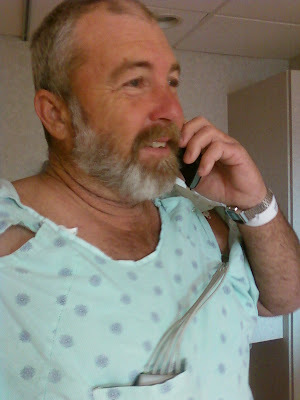 He started the next morning with a stress test and a sonogram of his heart. The stress test came back with what they call a positive result which meant further tests. He was scheduled for a heart cath for the next morning. I worried all night. 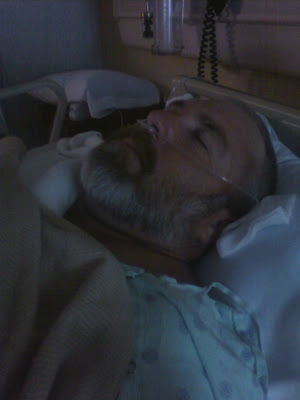 Two nights sitting in a chair next to the man I love, watching, waiting, praying, hoping, begging for him to be alright. We had many things explained to us from different people and none of it sounded good...I just knew we were in for a battle...you see it runs in his family. The next morning came and the new Cardioligist came in to explain the procedure and say that he didn't believe the outcome of the stress test and that he felt sure that everything was going to be just fine. I took a breath and hoped that this doctor was the one that was right. We waited, and finally they came to take him for the heart cath. I followed along...I was told that I could watch the procedure being done. I went into an observation room and watched on a monitor the doctor guide the cath to my husbands heart. I saw his heart beating...I saw his arteries working...I saw a miracle. His heart is the heart of a teenager in the words of the doctor. He has a strong heart. Music to my ears. Music to my heart. I was so relieved as I watched the man I love laying on a gurney going through this test that told us this wonderful news. I was beyond happy. After Kenny woke up and was moved back to his room, the doctor came in a told us the good and bad news. The good news...his heart is strong and healthy...the bad news...this can happen again. We don't know why...but several million people are effected. We just have to watch for signs and be cautious. He is only on a low dose of blood thinning medication, and seems to be just fine. I am relieved. I am grateful...I am in awe...I am so happy that our life together can go on. Lesson learned. I will cherish each day I have with my family, I will cherish the little things that I was kind of taking for granted, I will be thankful for each and every day, I will make sure that the people I love know it. I will continue to have faith that everything will work out. Here is a picture of Kenny telling his parents the good news. Just had to share. Yvonne, I'm so sorry you had to go through that but so glad it all turned out ok! hugs! !